About 12 million people around Russia and abroad have joined Victory Day parades to mark 70 years since victory over Nazi Germany in WWII. Many of them gathered to march with the so-called “Immortal Regiment” to honor the veterans of the war. The numbers were announced by one of the movement’s organizers, Nikolay Zemtsov. Crowds of people carrying photographs of veterans who went through World War II have come to rally across Russia in a symbolic action known as the Immortal Regiment (Bessmertny Polk) march. “They must march on victoriously at all times,”says the statement on the event’s web page. Petropavlovsk-Kamchatsky in Russia’s Far East was among the first cities to host the march Saturday – about 3,000 people rallied there after a military parade. 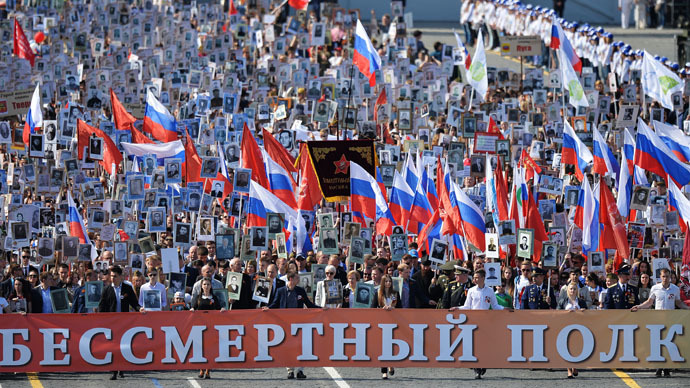 The march in the homeland of the Immortal Regiment, the city of Tomsk in Siberia, attracted some 30,000 participants. The marches will be taking place all across Russia – from Vladivostok in the Far East to Kaliningrad, the country’s westernmost territory. In Moscow, over 500,000 people have taken part in a march on Red Square, according to organizers’ estimates. Russian President Vladimir Putin has joined the march in Moscow. He was carrying a portrait of his father, who fought the Nazis during WWII. “The Immortal Regiment brings together people whose grandparents fought from 1941 to 1945. Thus, we are honoring the memory of heroes who earned this hard-won victory,” the event’s organizer Nikolai Zemtsov said. This year, the Immortal Regiment action has also spread far beyond Russia. In the capital of Kazakhstan, Astana, the march attracted some 2,000 participants. The event have also taken place in Ukraine’s Dnepropetrovsk, Israel and Belarus’ Brest. South Korea has joined Immortal Regiment action for the first time. New Yorkers staged their own event May 4, as about 100 people crossed the Brooklyn Bridge, carrying the photos of relatives who took part in WWII. Seventy years ago, World War II, the deadliest conflict in human history, came to an end as Germany’s Instrument of Surrender came into force. Almost 80 percent of the world’s population were caught up in the six-year war, including all of the great powers, and a total of 55 million lives were lost in the conflict. The Eastern Front, which was where the USSR clashed with Nazi Germany and its allies, stretched for 1,400 kilometers, from the Arctic Circle to Crimea. When it broke out in 1941, it became known as the Great Patriotic War in the Soviet Union - a name that became crucial for the history of the country, whose casualties amounted to least 27 million people killed in four years of fighting. In Europe, commemorations started on Friday as Nazi Germany’s Instrument of Surrender came into force at 22:43 CET on May 8, 1945. In Moscow it was already 00:43, on May 9. Ceremonies were held in the Polish port city of Gdansk, known as Danzig in German, where the first shots of the war were fired on September 1, 1939. A mass was held at the infamous Dachau concentration camp, where 32,000 people died according to official documents, but where thousands more were killed unofficially. On Saturday, a rally will take place in Berlin, Germany, in Treptower Park where there will be a ceremony at the Soviet memorial. Madrid will see wreath laying ceremony in the cemetery of Fuencarral to the monument for the Soviet volunteers that participated in the Spanish Civil War. Similar celebrations will take place in Sydney, Australia, as well as in the Americas. Оn Friday, dozens of vintage airplanes flew over Washington, DC to commemorate the 70th anniversary of the victory in Europe in World War II. The air show, dubbed “The Arsenal of Democracy,”featured trainers, fighters and bombers used by the Allies. A plane with a huge St. George’s Ribbon (3 meters wide and 75 meters long) will fly over Montreal, Canada. Military parades celebrating the 70th anniversary of the victory in World War II were held all over Russia, from the country’s Far East to Crimea. About 85,000 servicemen from the Russian Armed Forces were involved in Victory Day celebrations all over the country, the Defence Ministry press service said. Military parades took place in 26 cities, while ceremonies devoted to Victory Day were held in more than 150 cities in Russia. The biggest parade took place in Moscow’s Red Square, in a grand event involving the newest hardware at the army’s disposal. Tigr and Kornet D armored vehicles, advanced BMD 4M and Rakushka vehicles were presented at the parade. Armata-based T-14 tanks, which will become the backbone of the Russian armored forces, also rolled across Red Square. The Republic of Crimea and the city of Sevastopol have seen Victory Day parades for the second time since reunification with Russia. Russia’s President Vladimir Putin addressed the Victory Day parade in Moscow, welcoming the foreign guests who had arrived for the parade and thanking the representatives of the countries who fought against Nazism in WWII. “The Great Patriotic War [the way Russians refer to the conflict between the Soviet Union and Nazi Germany], was a battle for the future of all humanity,” said Putin. "Our fathers and grandfathers went through enormous sufferings and losses. They worked to the point of exhaustion, strained to the limit and they fought without sparing their lives." Putin observed a minute of silence for soldiers killed in battles, members of resistance movements, prisoners of deaths camps and all the civilians who perished to the hardships of sieges and wartime. Another minute of silence will take in every Russian city at 18:55 local time (15:55 GMT when it comes to Moscow). This is the moment to remember incredible losses in Great Patriotic War as in Russia, as well as other countries of the Soviet Bloc, every single family was affected by the war. Fireworks will conclude the day of commemoration.